Josh Norris’ Minor Matters blog has more video as well. 5:55 PM — Shaeffer Hall has been placed on the Thunder DL with a “left big toe injury.” He is fine. It’s just another pitcher getting shut down because of innings. 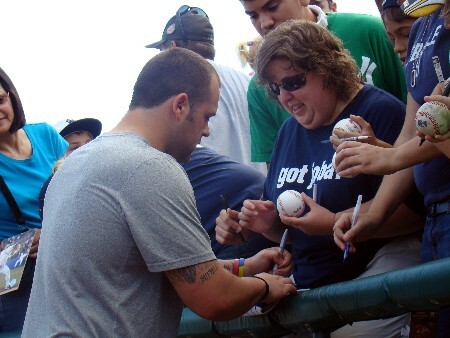 4:35 PM — So, word out of New York is that Joba Chamberlain — who was physically in Trenton this afternoon — was going to be activated tonight after the Yankees traded Chad Qualls to Pittsburgh for Casey McGehee. 3:30 PM — Today’s going to be a fun one. Gerrit Cole vs. Brett Marshall, a Joba Chamberlain rehab appearance and it’s trade deadline day. I’ll have you covered here all day long. Lineups when we get them. (PR) (Trenton, NJ) The season’s premiere pitching matchup will take place Tuesday at Waterfront Park as Thunder ace Brett Marshall is slated to face last year’s number one overall draft pick Gerrit Cole. In addition, New York Yankees pitcher Joba Chamberlain, who is recovering from a dislocated ankle, is expected to make a rehabilitation appearance for the Thunder. Eastern League All Star Brett Marshall has shined this season posting an 11-4 record with a 2.90 ERA with Trenton. Marshall leads the Eastern League in wins (11), and is 3rd overall in ERA (2.90). Entering the season Marshall was rated the #11 prospect in the Yankees organization by Baseball America. Marshall will face Altoona’s RHP Gerrit Cole, the 2011 No. 1 overall draft pick and #1 rated prospect in the Pirates organization. Cole was originally drafted by the Yankees in the first round (28th overall) in 2008 out of Orange Lutheran High School but opted to attend UCLA. Cole started the season at high Class A Bradenton, where he began a smooth transaction into minor league baseball posting a 5-1 record and a 2.55 ERA in his first 13 starts. Leading up to this year’s Future Game, the 6’4”, 200 pound right handed hurler was promoted to Double-A Altoona where he has posted a 2-1 record in his first three appearances. Cole was recently ranked #8 in MLB.com’s top 100 prospects list after showcasing his 95 mph fastball and backdoor slider throughout this season. 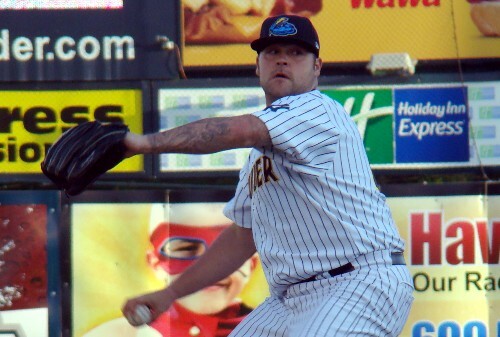 Joba Chamberlain pitched 1.1 innings of relief and struck out three for the Thunder on Sunday evening against Harrisburg. Chamberlain was the 41st overall pick by the Yankees in the 2006 draft and in 196 games since his Major League debut in 2007 he has a 20-13 record and 3.70 ERA and four saves. 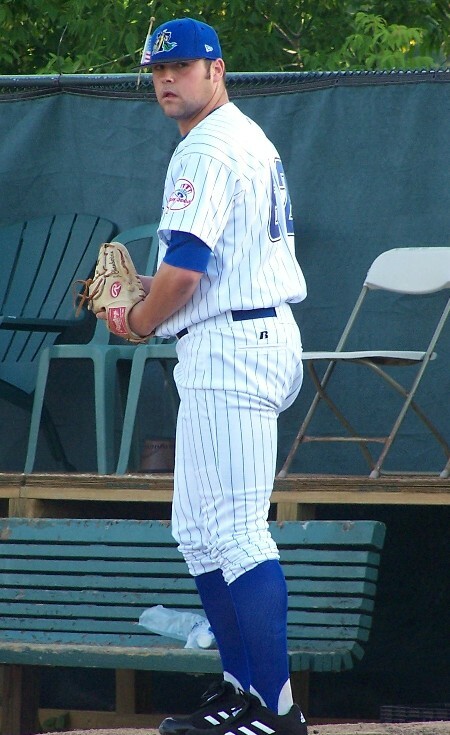 In 2007, Chamberlain was a member of the Trenton Thunder, going 4-2 with a 3.35 ERA. Tuesday is Macy’s Back To School Night with Macy’s Gift Cards awarded each inning to lucky fans and our Jewish Heritage Night celebration. Every Tuesday is $1 Hot Dog Night thanks to Black Bear Franks and Kids Eat Free thanks to On The Border. All Trenton Thunder tickets are available at 609-394-3300 or online at trentonthunder.com. — There’s plenty of Joba Chamberlain stuff on here. So I’ll get to him in a bit. But the news was not all good for the Thunder after their 3-2 come-from-behind win against the Harrisburg Senators on Sunday night. Outfielder Neil Medchill will likely miss the remainder of the season after suffering a stress fracture in his left leg. Medchill, who is believed to have been playing with the injury for the past two weeks or so, had really picked up his play as of late. In his last 10 games, he was hitting .342 with four home runs and nine RBI. Medchill was on crutches after the game, and leaves the Thunder outfield with Rob Segedin, Melky Mesa, Zoilo Almonte and possibly Kevin Mahoney, who played in right field tonight after being moved out of third base by David Adams sudden shift there. — OK, the Joba stuff. I’m not transcribing quotes you can see in the video below this post. Wanna know exactly what he said and how he said it? Watch the video. It’s why I shot it. It saves both of us some time. Here’s the perspective of Thunder catcher J.R. Murphy and Harrisburg right fielder Jimmy Van Ostrand, who faced Chamberlain. — Quite a few things get overlooked during a rehab…the starting pitching efforts of both Shaeffer Hall and Senators starter Ryan Perry are among them. Perry, who is becoming a starter in the Nationals system after three years of big league relief for the Tigers, shoved it to the tune of two hits and two walks through six innings. Hall was no slouch himself, allowing one earned run through 6 2/3 quality frames. Mark Montgomery also picked up his first Double-A save. 7th inning — Chamberlain enters the game with nobody on and two outs. Throws 9 pitches/7 strikes. Allows one runner to reach on an error. Hits 98 MPH. 8th inning — Chamberlain allows a leadoff single to Zach Walters, but recovers to strike out the side…final line is 1.1 IP, 1 H, 3 K. 30 pitches/23 strikes. The plan for Joba Chamberlain is as follows. He will enter the game in relief, presumably in the middle of an inning and preferably with runners on. Shaeffer Hall obviously would not enjoy the latter scenario. Chamberlain is not available to the media prior to the game, so we’ll have comments from him afterwards. (PR) (Trenton, NJ) – RBI doubles from Luke Murton and J.R. Murphy in the sixth inning brought the Thunder from behind against Major League rehabber Chien-Ming Wang en route to a 4-3 victory and eventually a doubleheader sweep of the Harrisburg Senators Saturday night in front of 5,780 fans at Waterfront Park. The Thunder (63-44) took a nightcap that was shortened by rain to six innings, 5-1, and in the process remained perfect in seven-inning games this season (12-0). Trailing 3-2 in the bottom of the sixth (of a seven-inning game), Trenton got a one-out double from Zoilo Almonte against Wang (1-2) before Murton lined a game-tying two-base hit into right center. Two batters later Murphy drove the game-winning double over the head of centerfielder Brian Goodwin scoring pinch-runner Jose Pirela from second base. Vidal Nuño (6-2) allowed three runs on six hits in six innings to earn the victory, while Kelvin Perez pitched a 1-2-3 top of the seventh to record his fourth save. Wang, rehabbing from the Washington Nationals after suffering a hip strain earlier this month, was charged with four runs on nine hits in six innings. Trenton scored two runs in the first and three more in the fourth against Harrisburg starter Ryan Tatusko (2-4) during game two. Murton’s two-run double erased an early 1-0 deficit in the opening inning. In the fourth Rob Segedin and Pirela recorded RBI hits while Yadil Mujica drove in a run with a groundout. Craig Heyer started for the Thunder and worked 3.2 strong innings, allowing one run on three hits and striking out four. Graham Stoneburner (2-0) pitched the final 2.1 frames before the rains came and earned his second win of the season. Melky Mesa homered against Wang to lead off the bottom of the first in game one and went 4-for-6 in the doubleheader. Segedin also went deep in game one and had three hits on the night. Murton drove in three runs for Trenton. The Thunder and Senators conclude the five-game series Sunday late afternoon with first pitch scheduled for 5:05 pm. Left-hander Shaeffer Hall (8-7, 3.50) is expected to start for Trenton while Harrisburg counters with righty Ryan Perry (1-2, 2.14). Major Leaguer Joba Chamberlain is expected to join the Thunder on injury rehab for the game and pitch in relief at some point. Limited tickets are available by contacting the Thunder box office at 609-394-3300 or online at http://www.trentonthunder.com. Radio coverage on 91.3 FM (WTSR) and also streaming online begins at 4:45 pm. I won’t be at the ballpark for tomorrow’s start by Chien-Ming wang, but…you know what, I’m excited about Joba’s appearance. I’m pretty open about the fact that I hate rehabs, but this one won’t be too bad and it’ll be over with pretty quickly. Plus, it’s not the end of the world if I don’t get to chat with him, because I covered him when he was originally with the Thunder in 2007. I remember interviewing Chamberlain and Ian Kennedy in the same day — quite a haul, looking back on it — and I wanted to do something different on him than what everyone else was doing…and trust me, he was getting a ton of press even then. So I delved into his Native American heritage a bit…which isn’t something I’m real comfortable doing because I’m not at all familiar with what to ask. But he couldn’t have been nicer about it — he was a nice guy in general, he introduced himself to me before I even went up to him — and I’ve pulled for him ever since. Looking forward to seeing him live at Waterfront Park again, I only got to see him once…but it was very memorable. He struck out 12 in six innings in one of the most dominant performances I’ve seen in the capital city. — So, it would be a little disingenuous of me to go around posting Gerrit Cole and Dylan Bundy video on a blog in which I cover the Thunder, and then not post video of the Thunder when I cover them. Thus, here are a few Thunder AB’s and Dellin Betances’ third inning from the first game, as well as Brian Goodwin facing him in the fourth. — Full disclosure, I didn’t stay for the end of Game 2. Left to get home before midnight, but I did stay for six innings out of the seven. Real nice little spot start by Ryan Pope, limiting Harrisburg to just one hit through three innings. — At times, Dellin Betances had the kind of stuff that Chamberlain showed in that start I mentioned earlier. He struck out the side in the seventh. In order. On nine pitches. But Betances can also be mindnumbingly frustrating at times, as evidenced by the walk he issued to the first batter of the eighth. On four pitches. But perhaps most important given that it was a doubleheader, he went seven innings…which is only the second time he’s done that in a Trenton Thunder uniform. He didn’t get much help from his defense at times, and only one of the four runs he gave up were earned. — I’m never too comfortable talking about myself, but I just want to thank everyone for their kind words for my brief little moment of fame on Baseball Tonight when they showed my Dylan Bundy video. I was actually in the press box during Game 2 when someone was watching BBTN on their phone and played the clip for me. Pretty damn unreal. Thanks to Steve Berthiaume of ESPN for going about it the right way and asking me if it was OK to use the clip and then using my name on air…totally first class right there. 4:45 PM — Long trip back…but I made it. Ryan Flannery and Walter Ibarra have both been activated off the DL. Lee Hyde was promoted to Scranton and Neil Medchill has been placed on the DL with a legit lower left leg injury.